Shaddad was historical king of lost Arabian city of Iram of the Pillars. Various sources suggest Shaddad was the son of 'Ad/'Aad, the son of Shem, the son of Noah. 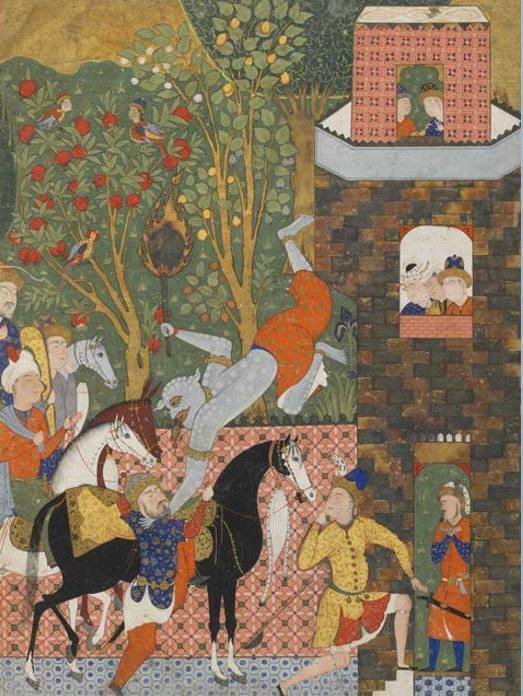 The angel of death descends on Shaddad ibn 'Aad, from the dispersed Falnameh, 1550 CE. Brothers Shaddid and Shaddad reigned in turn over the 1,000 Adite tribes, each consisting of several thousands of men. It is said Shaddad brutally subdued all Arabia and Iraq. Many Arab writers tell of an expedition of Shaddad that caused the Canaanite migration, their settling in Syria, and the Shepherd invasion of Egypt. Story of Shaddad is found in the 277th through 279th nights of the Tales of the Arabian Nights (The Book of One Thousand and One Nights). Artistic rendering of ancient city of Ubar of Qom-i Aad, to whome prophet Hud As was sent. According to the Quran, Iram of the Pillars was a city of occult worshippers of stone idols, who defied the warnings of the prophet Hud. To punish them, God sent a drought. But the people would not repent, so they were destroyed by a furious wind, from which only Hud and a few believers emerged.